Some readers will know that I've just been appointed as half-time parish priest and half time "Seeking Justice" Adviser for Mansfield and district Anglican Churches. Well, a new job needs a new website. Part of my new role will be helping people find out what skills they have or need for grass roots activism and their own liberation theology. So here's the website. I'll still be contributing regularly to this blog, however, on more explicitly anarchic themes. Phew! I had the t-shirts, the posters, the buttons. I chanted “Yes, We Can” and watched the videos. I believed in his hope. As a brand new Bachelor of History and Political Science, I wanted things to change and believed they were changing. I cast my absentee ballot, and I was there in Grant Park the night he was elected. But the minute the crowd started chanting, “Yes, we did!” I was uneasy. What did we do? Contribute to his campaign (over $650 million)? Put signs in our front yards or slap stickers on our cars? Check a square, connect an arrow, punch a hole, press a button? Attend a rally? “Yes, we can” was supposed to be the rally cry for all Americans to work together—both parties—after the election on the incredibly difficult issues we faced as a nation. The message “yes, we did” implied that our work was done. Go to it, Mr. President. Fix it for us. I wasn’t just disheartened by the crowd and the din. Almost a year after the election, I read an in-depth article about predator drones in Pakistan. His administration turned to impersonal, anonymous tactics that killed innocent people. The war wasn’t ending. He was bailing out corporate executives who lined their pockets with Americans’ money at Christmas time. It started to seep in that this guy couldn’t do it. He could give inspiring speeches about hope and change, but he couldn’t end wars. He couldn’t fix the economy. If it seems like I’m heaping unfair blame upon his head, I’m not. The Republican candidate couldn’t do it either. Third party candidates couldn’t do it. No man or woman could. I haven’t voted since 2008, not even in two pretty huge elections in Wisconsin. It’s not political apathy; it’s the opposite. I care too much about the world to leave it in the hands of two squabbling political parties who waste more money and breath on bickering and stalemating and generally ignoring the welfare of all citizens. But I still believe in “Yes, we can.” In fact, I believe it now more than ever, which is why I’m not voting. My big breakthrough came with the spring. In 2010 I lived in Chicago. I often angrily stewed that the city neglected my neighborhood because it didn’t contain the right demographic or the larger-than-life attractions that allure downtown visitors. When I walked down my boulevard and spied trash accumulating beneath trees and in gutters, I muttered curses under my breath about the Chicago Department of Streets and Sanitation. But one day, it dawned on me. Why am I depending on the city to clean up my neighborhood? My neighborhood. What kind of effort would it really take for me to get up some Saturday morning to stuff a plastic bag with the abandoned rubbish? What would it take to invite a neighbor or two to do it with me? I had given up my power and responsibility for my neighborhood to a corrupt city government. The biggest, most positive changes we’ve seen in this world result when people organize, mobilize, and work for and demand change. Not politicians, not world leaders, not businessmen/women, not the GOP or Dems. People—of all faiths and creeds and nationalities and genders and races and walks of life. The Labor Movement. The Civil Rights Movement. India’s fight for independence. The end of Apartheid. Governments in almost every case have been the cause of pain and strife. They have organized hate and crime through wars, promoted racism and prejudice through unjust laws and courts, abused power to reward special interests, institutionalized poverty and created dependency on corporations. Four years ago I elected someone I thought might stop the cycle. I learned that “electoral success… pacifies.” Suffrage has merely been granted to our forebears to pacify them continuously. Many men who fought in the Revolutionary War were ineligible to vote in the new Republic’s first elections (only property owners had the right). Black men and women built this country for 246 years without ever getting to choose who wrote the laws that enslaved them. Women of all races worked side-by-side with their fathers, husbands, brothers, and sons to build this country and then gave them up to war when asked to do so, but they waited 143 years for the right to choose policy makers. Even after winning suffrage, many black Americans faced prejudice at the polls that prevented their rightful vote. So while I appreciate the people in the past who fought for my suffrage, I also acknowledge how ridiculous it is that anyone ever had to fight for suffrage, to beg for the government to throw them a bone. Yes, I appreciate the men and women who fought for my right to vote. They fought for a right to choose who ruled because they believed their vote could make a difference. I've learned enough to know that my vote won’t make any difference. My vote instead endorses a system that has allowed obstructions to liberty; a system that gives me only two choices and two parties, neither of which I agree with, neither of which is actually doing anything to promote the well-being of the average American; a government that constantly violates the human rights it helped to craft, around the world and within its own borders; a government that will only continue to covet power, whether run by the left or the right, at mine and my neighbors’ expenses; a government that will continue to wage wars in the name of lofty ideological goals that it constantly contradicts; a government that will always only pay lip service (if any service at all) to correcting and acknowledging the historical evils it has inflicted for the past 236 years. 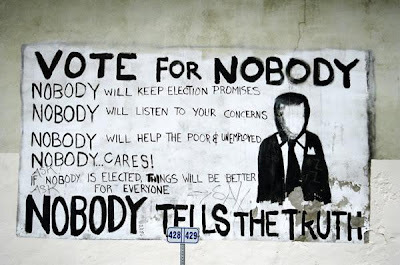 No, I won’t be voting in 2012, nor will I likely vote in 2014, 2016, 2018…. My time, energy, and money could be spent in such better ways, working for and enacting change that I actually CAN believe in, change that will have a far greater impact than hours spent lined up at the polls. I still believe we can “heal this nation” and “repair this world.” I just know there are better ways to do it than casting a ballot for a politician who will always disappoint. My time spent on November 6 is better spent in my neighborhood, in my community, working with my neighbors to love one another. A number of recent publications both in religious and anarchist studies have focused on religious anarchism, but consideration of their compatibility in the first place has been rarer. The aim of this edited book is to explore critically and frankly the relationship and tensions between these two notions. The collection will build on the successful stream exploring the topic convened for the Anarchist Studies Network Conference held at Loughborough University in September 2012. Authors of papers presented at the stream are invited to submit their manuscripts, but the call is also open to authors who did not attend the conference, yet wish to submit a manuscript for consideration. Proposals are encouraged from sceptical as well as sympathetic perspectives, the aim being to foster critical discussion. In line with the panel themes at the conference, areas of focus could include: anarchist encounters with religion, anarchist Biblical studies, anarchist theology, anarchism/religion parallels, religious and anarchist philosophers/philosophy, and spiritual anarchism. 1. Is rejection of religion (and/or spirituality) a sine qua non of anarchism? 2. What do we mean by ‘religion’, ‘spirituality’ and ‘anarchism’ when considering their relation? 3. What is unacceptable to anarchism about religion/spirituality, and to religion/spirituality about anarchism? 4. Are some religious/spiritual traditions inherently more compatible with anarchism than others? 5. Why do religious institutions tend to move away from the often radical intentions of their original prophets and founders? How does this compare to non-religious institutions? 6. What explains differences in the reception of religious/spiritual anarchism across different contexts? 7. To what extent can religious/spiritual anarchists’ deification of religious/spiritual notions (such as ‘God’) be compared to non-religious anarchists’ deification of secular notions (such as freedom or equality)? 8. What role do (and can) religious/spiritual anarchists play in the wider anarchist movement, and in their wider religious/spiritual tradition? 9. What can religion/spirituality and anarchism learn from one another’s history and ideas? 10. Is religious/spiritual anarchism really anarchist? Is it really religious/spiritual? All manuscripts will be rigorously peer-reviewed. Authors are asked to name three experts in the specific area covered by their papers that might act as potential peer-reviewers, though the editors reserve the right to approach any expert. Having made initial enquiries with Open Books Publishers, the intention is to submit the completed collection to OBP for peer-review (meaning that the whole book will be peer-reviewed on top of the earlier, individual, review of separate chapters). Authors are therefore asked to adopt the referencing style preferred by OBP, which is available here. Manuscripts should not exceed 8000 words (excluding footnotes, but please restrict discursive footnotes to a minimum). Shorter manuscripts are welcome. To avoid formatting incompatibilities, please submit your manuscript in a .DOC format – other formats will be returned. Should OBP accept the completed manuscript, authors may wish to note that they are keen for authors to addadditional digital material to their website, such as additional papers, primary texts, images or other primary resources. Authors should feel free to suggest such additional resources when submitting their manuscript for consideration. The deadline for receipt of manuscripts is 31 December 2012. Please email your manuscript to Alexandre Christoyannopoulos at a.christoyannopoulos [at] gmail.com. Any enquiries should also be sent to that address. What I took away of most value from all of this was the idea that anarchism is not about freedom at all, since personal autonomy is really an illusion, but rather it is about a particular freedom: freedom from fear. It is food for thought indeed. The occupation actions of main squares in especially heavily authoritarian states like Tunisia and Egypt were about the conquest of fear. We could witness the millions defying the curfew which had been in place for such a long time in Egypt. This was (and is) the anarchist side of revolution in these countries, and perhaps with most of the following similar actions elsewhere. As it goes with action, it also had the element of overcoming fear of relating to others you would not have related to without the action. Has it all calmed down now and are we witnessing the quietness of the grave, or the silence just before the outbreak of a new and bigger storm? We shall see. It is an interesting thought - the state as a neolithic (probably late neolithic) invention. I presented it in my last examination to become a political scientist - Oppenheimer is a mostly forgotten libertarian socialist who is also the brain behind the original kibbutzim-idea (which must not be associated with the founding of a state). But reading Debt by David Graeber in between conference hours I hear that the thought is much older than from the early 20th century: Ibn Khaldun - founder of the disciplines of sociology and social anthroplogy, and also a mystic - wrote it earlier, in the 14th century A.D. I know earlier on Czech sociologist Ernest Gellner stressed the importance of Ibn Khaldun's thought and the anarchist consequences of it. The state as a mechanism based on fear - fear of "the others" who are coming to destroy your livelihood, fear of "chaos". If the state is based on fear which has to be shielded off at the cost of the fearful themselves then it is really sure: anarchism is about overcoming fear. A fascinating new look at the old -ism. The Anarchist Studies Network held their second conference this week. Although I had to miss all the afternoon sessions it was great to be a part of the event and to know that there are so many activists and academics interested in working out the implications of anarchist thought in new contexts. I decided to stick with the Religious Anarchism stream throughout, partly because of a lack of time to explore the others. I'm glad I did though as it was interesting to see trends emerge and stick throughout. The most obvious is the almost ubiquitous references to Mikhail Bakunin in almost every paper in this stream. Bakunin was yet another Russian prince turned anarchist, but unlike Kropotkin, the 'gentle anarchist' Bakunin was most likely to be found in the thick of the action of protest and resistance in varoius places around Europe. Both found themselves locked up at one time or another for their actions and views. Bakunin begin academic life as a theologian but is most famous for coining the phrase, "No Gods, No Masters" that has become something of an anarchist credo. Despite this antipathy to religion it seemed the overwhelming view of contributors to the Religious Anarchism stream that Bakunin had much in common with religious anarchist perspectives. I know! There was a real mix of content and style at the conference - some very carefully referenced or nuanced, others a little more like apologetics than anything else, but there was a real openness to scruting from all the contributors I saw and a desire to learn from one another. It is freedom from fear that allows us to choose the constraints, socially, lingusitically, philosophically, in which we choose to live our lives in relation to the rest of material and spiritual reality. There is no fear in love, but perfect love casts out fear; for fear has to do with punishment, and whoever fears has not reached perfection in love. (1 John 4: 18). 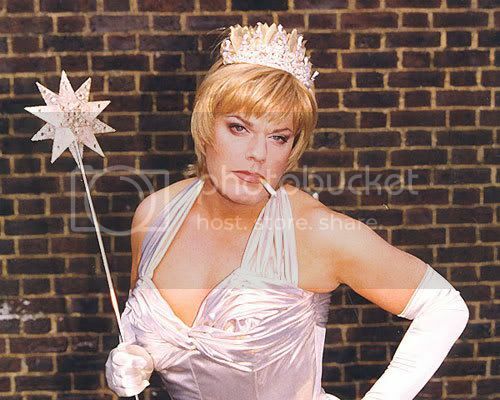 Eddie Izzard: A True British Queen to be proud of? I was gently challenged over lunch at the Anarchist conference to share my thoughts on how I can, without crossing my fingers, affirm an oath of allegiance to the Queen, "her heirs and successors" and continue to write, think, and act on anarchist ideas. I first swore allegiance to the Queen on my ordination as deacon in the Church of England. However, every time an Anglican priest is given a new license, in other words appointed to a new role, the oath is renewed. I can only assume that the Queen doesn't think we really mean it. Ahem, perish the thought! This evening I'll be licensed as "Pioneer Associate Minister" at St Mark's Mansfield, and as Deanery Adviser on Seeking Justice. At the service at which this formally happens I will renew my oath. Before I first did this I was given advice by plenty of lefty Anglican priests: "cross your fingers," "think of a different Queen. Ru Paul? Eddie Izzard?" "Don't take it too seriously". None of these ideas struck me as satisfactory. I need to either not do it, or do it with some sort of theological integrity. There's plenty in the Old Testament that gives a view or ten on the place of the monarchy. From the hyperbole surrounding Solomon's reign to the brilliant satire against rulers in the book of judges. But the text that I chose that spoke to me most of my dilemma was Samuel's mediation between Israel and God on their desire to have a king "like other nations" (1 Sam. 8-9). Until this time the Bible describes Israel more as a confederacy of tribes. Occasionally a military leader, or Judge, will come forward but mostly, as described in the closing words of the book of Judges, "In those days there was no king in Israel; all the people did what was right in their own eyes." (Judges 21: 25). But as Samuel, the final 'Judge' reaches the end of his life the people get twitchy. A small people-group surrounded by Super-Powers they longed for some political security. Samuel is clear. If the people ask for a King they are, in effect, rejecting God as their King. Choosing Monarch is making a choice for idolatry. Samuel is dismayed at the idea. However, God is more easily persuaded. Sometimes it's easier to back down on your own behalf than for someone else, or perhaps it's just that God is an anarchist and refuses to stand in the way of human consensus. Give them what they want, says God, and give it them 'good and hard': "Now then, listen to their voice; only—you shall solemnly warn them, and show them the ways of the king who shall reign over them." (1 Sam. 8: 9). In Britain there is an established Church and a Constitutional monarchy. Both are idols and both represent a rejection of God as King. But God, I believe, is an anarchist, and blesses whatever is offered. For most of us what is offered is done so with the best of intentions and God longs to bless. So, following Samuel's example, and listening to God's desire to bless whatever the people of God offer. I will be renewing that hideous oath this evening. I choose to do so and no one is coercing me to do so. I would rather not make the choice and pray for a day when there is no monarchy so vain as to ask for my allegiance, and I'm sure that day will come. In 1998 I undertook the travel to the university of Haifa to give my first Conference Lecture. In the story I give a link to you can read how by the grace of God I still was able to give my lecture in spite of all kinds of odds, and it was an unforgettable experience to see a pretty young lady from Slovenia writing down notes about Louis A. Bähler, someone not at all known in the Netherlands itself. (This is the lecture she and others were attending and taking notes about). "Count your blessings", a professor said to me when I told this. Well, I was invited to come along when in Slovenia but have not been there yet, and now it is all a memory. Just like the rest of the story from 1998 - someone with whom I shared a student flat around there asked me how it felt after doing this first lecture. Giving a speech in public is different, I can say, I had experience with that. One of the differences is that the conference will still be going on but you did your thing and... - I said that I felt like an animal triste. Fortunately she did not need further explanation which I will not be giving here either. The feeling came over me last week when I completed my text for a presentation at the Anarchist Studies Network Conference in Loughborough, next week, more precise the ASIRA-part of it (as I would like to call it). "Is that all there is?" after all. I suppose so. And then there will the pressure to speak loud and clear on a subject you do not quite understand (it is no use talking about a subject you understand) in a language which is not your mother tongue and finish within twenty minutes. Great. Call me animal triste any time now. A part of my presentation is meant to be about a Dutch Christian anarchist I only came to study after his death in 2006. He lived above the place where I worked about fifteen years ago, I only spoke to him when he moved out. His written legacy amounts to a eulogy of Human Rights which will prevail above Evil and Statism and power that cannot be real power. Thinking of Iraq, Afghanistan, Kosovo/Serbia, Syria probably and the PussyRiot hype I do not particularly feel comfortable about the idea. I am giving here my first and last personal notes for the conference on this Christian anarchist, Ernst Stern, and maybe you can understand my Conference Blues In Advance. I will probably have to skip these bits because of lack of time anyway. As a political scientist I grew up in my studies with a simple and effective definition of power as "coercive influence". Since power is the central theme in political science it may be helpful to have a definition, even though defining may be anathema as being undialectical. I must say I have difficulty with the idea of power of another Dutch Christian anarchist I turn to now, Ernst Stern. He was a theologian and I only realized he was a Christian anarchist when he died at the age of 80 in 2006. Amazingly, then I had to conclude that he was responsible for copying my first “political” article as an activist in the review he edited, Militia Christi, journal of radical or pacifist ministers of the Dutch Reformed Church. I remember my mixed feelings of the time: proud and at the same time dismissive because the paper had to be associated with the Church and I did not like that. The idea or the discovery of Christian anarchism for me was far away still - it was 1970 to be exact. Stern calls himself an anarchist, he should as a minister be considered as a Christian but the word Christian-anarchist seems unknown to him. I have not read an assessment by him of the bombing of Serbia, Afghanistan or Iraq in the name of human rights as we have witnessed in the recent past. Detaining Chief Geronimo was already excused by the white invaders of North America with the story that he kept on beating his wife. Both Stern’s estimate of the legitimacy of power and the liberatory force of human rights can be seen as very optimistic and maybe he was - and optimism, I read with Ursula LeGuin is the most important quality of anarchists. Which brings me to my personal final note - the article that Stern copied in Militia Christi, his review, in 1970. In it I wrote that we should forget about the apologists who applauded the genocidal quick kill against Biafra. I have not forgotten the names of these apologists though, but I know that from the media-administered public memory the genocide and the call for a quick mass murder have been banned and properly removed. I cannot ask Stern any more if this state of affairs for him is reason to remain optimistic. I know I still am, otherwise I would not have given this introduction. What is in between I will try to squeeze in at the ASN Conference.